We talk a lot about nutrition in pregnancy, but eating well is also incredibly important in the postpartum as we heal, undergo many physical and emotional changes, and begin breastfeeding. It is so important to take care of ourselves at this time. It is also one of the more challenging times to practice self care, as we are busy caring for our newborns and juggling a whole new set of demands. For many women, postpartum eating needs to be as simple and quick as possible. Women are greatly helped in the postpartum when others are able to spend more time preparing and offering her healthy meals and snacks regularly throughout the day. Preparing meals ahead of time to freeze and make later is a good idea, although we want to take care to choose foods that are going to serve the body best. 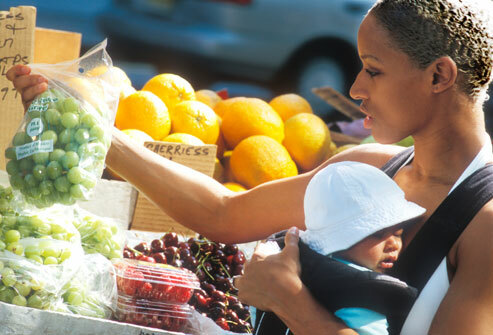 Loved ones may also offer to make healthy meals, which can be organized by a close friend or family member or with the help of online services such as Meal Baby, Take them a Meal, Food Tidings, and others you can find via a search for “meal registries.” Check out our post on preparing for the postpartum. Here are some principles of optimal nutrition for the postpartum. Our midwives can also talk with you about postpartum nutrition in greater detail during a prenatal or postnatal appointment. During the later months of pregnancy, women need to consume about 200 to 300 more calories than their pre-pregnancy requirements, as a general rule. Breastfeeding women need even more than this. Women generally need about 500 extra calories to make enough milk to feed baby and to get the nutrients they need. As we mentioned in a previous post, consuming less than this does not help mamas lose weight, but actually encourages the body to hold on to fat reserves. Most women need 2 to 3 liters of water a day in the postpartum to heal and to make milk. A new mama’s support team should be aware of her need to stay well hydrated and ensure she has access to water at all times. Make sure glasses or bottles of water are stashed anywhere in the house where mama and baby spend time throughout the day and night. New mamas typically get an intense feeling of thirst each time they begin to breastfeed, a cue from our bodies that we really need to drink lots of water during this time. Increase vitamin C to help absorb more iron from your food. Take C with your meals and don’t exceed 3000mg a day, or as directed by your care provider. Cook using cast iron pans and pots, iron from the cookware actually gets into the food you eat while cooking. Women are encouraged to continue taking their prenatal vitamins until they are done nursing. This extra nutritional support helps mama and baby. Extra B vitamins can give you a boost in energy and stamina. It is also a good idea to regularly eat low-mercury fish (the most bioavailable forms of DHA are found in coldwater fish and algae) and/or take an Omega-3 fatty acid supplement with a higher DHA to EPA ratio (taking a supplement is a reliable way to make sure you are getting enough). Studies have found that infants benefit neurologically when moms supplement during pregnancy and throughout the breastfeeding relationship. These healthy fats also benefit mamas by helping them heal and by replenishing the nervous and reproductive systems. In general, whole, organic, protein-rich, nutrient-dense, warm and nourishing foods are ideal in the postpartum. It is best to avoid cold, processed and high-sugar foods as well as dairy, and peanut butter (at least for the first few days as these latter two are hard to digest). You may also want to avoid foods two which babies can be sensitive (a topic for another post! Fermented foods, such as yogurt, kefir, and sauerkraut. These foods promote “good” gut flora in mama and baby and may help prevent colic and the development of allergies in babies. Older PostCollective Wisdom: Why Did you Choose a Birth Center?